This section of the presentation describes the finishing process for bridge decks. 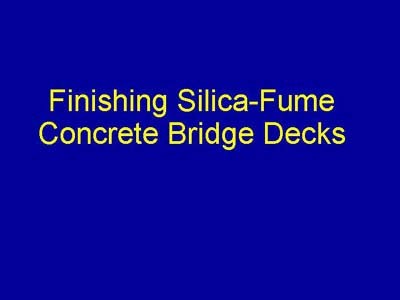 Actually, the procedure for bridge decks may be thought of as the precursor for the one-pass technique that was described for silica-fume flatwork. The most significant difference is that much of the work of finishing on a bridge deck is done by a specialized machine that consolidates, screeds, and finishes as it moves along the deck.